One of my favourite happenings at this time of year is the harvesting of fruit trees. It’s not often in adulthood that you get a chance to climb a tree and the ascent is made all the better by a semi sensible sense of purpose! 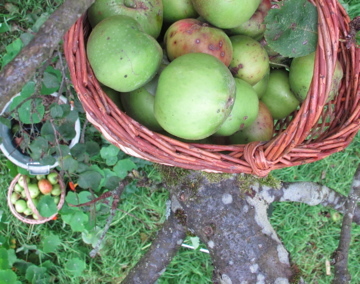 The exhilaration of clambering up the apple tree and greedily grabbing as many apples as you can manage whilst precariously hanging off some far too thin branch, it’s a great feeling made all the nicer by the crisp clear skies of late September. This year my son Jonah was just tall and strong enough to pull himself up after me and took great pride in being the chief basket handler, in a few years he’ll put me out of a job. 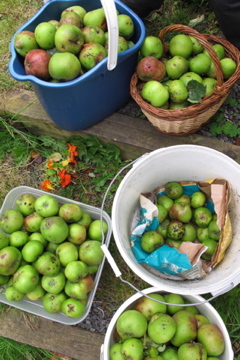 This is after all an event which can only take place once a year, the moment of surveying and assessing the crop, gathering it in at the right moment and storing those waxy healthy looking green globes is soon over, the tree is empty and the bulging baskets wait to be made into tasty pies or sit the winter out at the back of the garden shed wrapped in blankets. Picking apples brings back memories from childhood of my Great Uncle Con’s fizzy apple juice, he was quite an eccentric character and his apple juice seemed exciting and mysterious to us children, looking back now I realise that, as it was fizzy, it may have had some alcohol content, maybe that why we liked it so much! Uncle Con was always to be found out doors, wandering around the garden in his Donegal Tweed jacket, often with a piece of baler twine tied around his waist. I don’t know where he kept his apple juice, it appeared from some shed or outdoor place, the bottles were dusty and smelt musty but the juice was tangy and fresh. In the days I knew him he was an elderly man who travelled all over Ireland searching for rare wild flowers to photograph, he enjoyed sugar puffs for breakfast and cut the sleeves off all his shirts before wearing them. He died in his eightieth year whilst driving up the beautiful country lane to his house, just took a heart attack, the car rolled a stop. I like the idea of making apple juice in memory of my old uncle Con, pity I don’t have the recipe but likely it was never written down, I’m not sure what i’ll do with my share of the crop but the possibilities are endless.. I floated away reading this.. thanks for a dreamy nostalgic autumnal moment..